Summary: The effects of WW1 on America were wide-ranging covering the political, economic and social impact the Great War had on the United States. Unlike the countries of Europe, the factories and home of the US had not been destroyed. Manufacturing, production and efficiency had increased through necessity during the Great War. America had emerged as a world industrial leader and the US economy was booming, profits were increasing which led to the period in American history called the Roaring Twenties with a massive rise in consumerism for the wealthy. On the negative side, inflation was high and companies and corporations started the reduce wages and lay off workers to keep down operating costs. The power of the Unions had grown during the war, workers protested and 1919 saw a massive wave of strikes. Competition for employment led to racial unrest and race riots breeding hatred and suspicion which spilled over into the Red Scare and the fear of communism. The introduction of Prohibition led to the rise of organized crime, speakeasies, gangsters, increased violence and massive political corruption. the policeman on the beat, the man in the street." The following fact sheet contains interesting facts and information on the Impact, Aftermath and Effects of WW1 on America for kids. Effects of WW1 on America Fact 1: The impact of the Great War on the United States saw political, economic and social changes. The United States emerged from the war as a world military and industrial leader. Effects of WW1 on America Fact 2: Unlike the war-torn cities of Europe the homes and industries of the nation were relatively unscathed by the Great War. The late entry of the US meant that fewer men had lost their lives than in Europe. Effects of WW1 on America Fact 3: Production and efficiency in industries and factories had increased. Technology had advanced and the nation had entered the age of steel and electricity. Effects of WW1 on America Fact 4: Expectations: The Progressive Movement 1890 - 1920 gave rise to the many social and political Progressive Reforms changing the lifestyles and expectations of Americans. Effects of WW1 on America Fact 5: Women's Suffrage: The role of women changed during Great War, and many women took on the jobs of men. The influence and expectations of women and their role in society increased. Effects of WW1 on America Fact 7: There was a boom in the economy and industries were enjoying an increase in profits. However inflation was high and, in an attempt to reduce operating costs, businesses laid off workers and reduced wages. Effects of WW1 on America Fact 8: Inflation: Inflation increases the cost of living, the cost of housing, food, clothing and other essentials. In 1919 prices rose at an average of more than 15%. Effects of WW1 on America Fact 9: Before the war the nation had witnessed a massive increase in immigration from many European countries raising the issue of Old Immigrants vs New Immigrants. Effects of WW1 on America Fact 10: During the war between 300,000 - 500,000 African Americans moved north to the cities in the 'Great Migration'. Effects of WW1 on America Fact 11: The massive influx of people in the cities led to the squalid conditions and problems of Urbanization in America. Effects of WW1 on America Fact 12: Unemployment: Soldiers returning home from the war needed jobs and intolerance towards immigrants and African American grew. The levels of intolerance following the Great War had been fuelled by the blatant propaganda techniques used by the Creel Commission. Effects of WW1 on America Fact 13: Race Riots: In 1919 over 20 race riots broke out in the cities of the United States. The most serious was the 1919 Chicago Race Riot. Effects of WW1 on America Fact 14: Unions: During the war, the number of workers in Labor Unions increased dramatically. Workers had been given the right to strike, industrialists and business leaders wanted to break their power. Effects of WW1 on America Fact 15: Strikes: 1919 saw a massive wave of strikes in what was called the Red Summer. By the end of 1919 more than 3,600 strikes, involving more than 4 million workers, had erupted due to high inflation levels and wage drops. Effects of WW1 on America Fact 16: The Seattle General Strike of 1919 (February 6, 1919 to February 11, 1919) was a five-day strike by more than 65,000 workers that paralyzed the city of Seattle, Washington. It started as a shipyard strike but was joined by all the other Seattle unions and became a General Strike. Many Americans believed that Communists were behind the General Strike fueling the fear and distrust of Communism. Effects of WW1 on America Fact 17: The Boston Police Strike broke out on September 9, 1919 in which 75% of Boston police officers went on strike. Looting and rioting erupted in the city of Boston and the National Guard were called in. The police strikers were called "Agents of Lenin". Effects of WW1 on America Fact 18: The Great Steel strike of 1919 was a national strike lasting from September 21, 1919 – January 8, 1920 involving 350,000 steelworkers. U.S. Steel refused to talk to union leaders and hired African Americans and Mexicans as replacement workers. The Steel Companies instilled fear in the nation by equating the strikers with communists and public opinion turned against unions. Effects of WW1 on America Fact 19: Red Scare: It was in this climate that the First Red Scare (1918–1920) hit the nation. The Red Scare refers to the fear of communism in the USA during the 1920’s. Effects of WW1 on America Fact 20: The Palmer Raids: A series of bomb explosions in 1919, led to a campaign by United States Attorney General A. Mitchell Palmer against the communists called the Palmer Raids. Agents conducted raids on the headquarters of various radical organizations and the homes of immigrants and foreign residents. Effects of WW1 on America Fact 21: The FBI: Palmer established a special division within the Justice Department called the General Intelligence Division, headed by J. Edgar Hoover. It soon became better known as the Federal Bureau of Investigation (FBI). Effects of WW1 on America Fact 22: Prohibition: The Prohibition Era (1920 to 1933) was when the manufacture and sale of alcohol was banned. It was viewed as the solution to the nation's poverty, crime and violence. Prohibition was instituted with ratification of the 18th Amendment and enacted by the Volstead Act. Effects of WW1 on America Fact 23: Prohibition: The introduction of Prohibition Era in the United States led to the rise of organized crime, speakeasies, gangsters, increased violence and massive political corruption. Effects of WW1 on America Fact 24: The end of the Great War, and the start of the new decade, ended the Progressive Era and also ushered in a new period in which people with money wanted to enjoy themselves - it was called The Roaring Twenties (1920-1929). Effects of WW1 on America Fact 25: The Roaring Twenties introduced Consumerism and Materialism to the United States with massive changes to lifestyle and culture. Effects of WW1 on America Fact 27: During World War One Liberty Bonds, and later Victory Bonds, introduced the idea of financial securities to many Americans and encouraged the concept of investment by people from all walks of life. Effects of WW1 on America Fact 28: Ordinary Americans were building up high debts because of easy credit and started to gamble on the Stock Market, believing it was a 'safe bet'. Effects of WW1 on America Fact 29: The of wealth and excess of the Roaring Twenties ended abruptly with the 1929 Wall Street Crash. The Wall Street Crash of 1929, also known as Black Tuesday or the Stock Market Crash, began in late October 1929 when share prices began to fall. $30 billion was lost in the space of two days. The crash led to the ruin of many Americans and was followed by the Great Depression. The Great Depression effected both classes and became the biggest financial crisis the nation had ever known. Effects of WW1 on America Fact 30: The impact and effects of the Great War on America were extremely diverse and directly led to the period in history from 1917-1920 referred to as the First Red Scare and the emergence of the 1920's Ku Klux Klan. On April 6, 1917 the United States Senate declared war on Germany and fought with the allies in WW1. For additional facts and information about the effects of WW1 refer to the following links: . The article on the Effects of WW1 on the United States provides detailed facts and a summary of one of the important events during his presidential term in office. 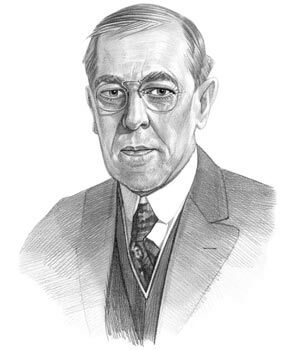 The following Woodrow Wilson video will give you additional important facts and dates about the political events experienced by the 28th American President whose presidency spanned from March 4, 1913 to March 4, 1921.